'Dune Grass' Swell Sculpture Festival. A celebration of the aesthetic of the Gold Coast Skyline and the human ingenuity that makes it possible, 'Dune Grass' employs minimalist shapes to mimic the windward form of its namesake. The street art veneer explores the themes of vertical living and coastal development in context with the realities of constraining forces. 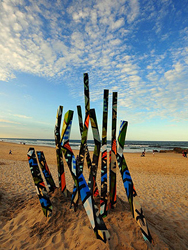 The end result is a bright and cheerful sculpture that embraces the distinctly different compass views that are offered from the sand dunes of our beautiful Gold Coast beaches. 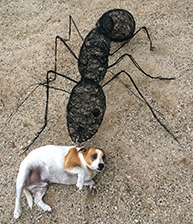 >>> Click here to watch video of my entry in the 2010 Swell Sculpture Exhibtion.